Standby…Standby…BLACK FLAGGED is a GO! UPDATED 11/13/2011: Thank you for a great launch week! So far, the total raised for the campaign is $253.50. Simply fantastic. I am extending the matching donation campaign one more week. All proceeds from sales for this next week will go to the Disabled American Veterans organization, and once again, I will match them. Spread the word! Early holiday gift? After some masterful stalling on my part, Black Flagged is now available and ready for public consumption. Only one year after my first novel, The Jakarta Pandemic…not bad for a part-time writer? Now that I have settled into a regular writing routine, the next one will come quicker. What’s new about Black Flagged? This time I did it right from the start. My first novel was a learning experience across the board. A good story from the beginning…but I had to relaunch the book at the start of the summer, with professional editing and a real cover (by a real artist). My sincere thanks goes out to everyone that somehow overlooked the editing issues and enjoyed the story…or just didn’t say anything. At this point, with 101 reviews on Amazon, and countless reader emails…my skin is pretty thick, and I take feedback to heart. So please don’t hesitate to let me know what you think…good or bad. With Veterans Day right around the corner, I am launching the book with a special campaign to raise money for Disabled American Veterans. If you plan to order a hard copy of my book, please consider taking a few extra steps to order the book from the special links listed in the BOOK STORE to the right, or at the appropriate button on the each book’s individual website. I’m doing this for both books. Learn more here. If you’re new to Black Flagged, here are a few links to bring you up to speed, and give you a taste of what’s in store, if you decide to take the plunge. More Samples are available in the SAMPLES section to the right.Grab a copy and sit back for a gritty, non-stop ride through some shadowy places, where trust is a hard concept to sell, and the term “economy of violence” is the key to hour by hour survival. Book One of the Black Flagged Series. A graduate of the Department of Defense’s experimental Black Flag program, Daniel Petrovich carries a secret he’d rather keep buried. A secret his government has hidden in the deepest vaults of the Pentagon. Unfortunately for Daniel, some secrets carry a debt that can never be repaid, and certain acquired skills will always hold their value. Someone is trying to raise Black Flag from the dead, and bring Daniel back with it. Someone who knows all of his darkest secrets. In exchange for the promise of a clean slate, and a chance to keep the life he has built with the woman he loves, he agrees to carry out one final mission. Now Daniel has an even bigger problem. The assassination of Mohammed Ghani, a wealthy Muslim importer, wasn’t the uncomplicated mission he had been promised. Seven other prominent Muslim businessmen are killed on the same night along the East Coast, suddenly extinguishing Task Force HYDRA, the most significant counter-terrorism investigation in recent FBI history. Daniel’s life is about to disintegrate, as he becomes the focus of a relentless FBI manhunt, and the target of a vengeful CIA agent. To survive, he’ll be forced to release a dark side he fought for years to keep suppressed. A dark side with few boundaries, and even fewer loyalties. 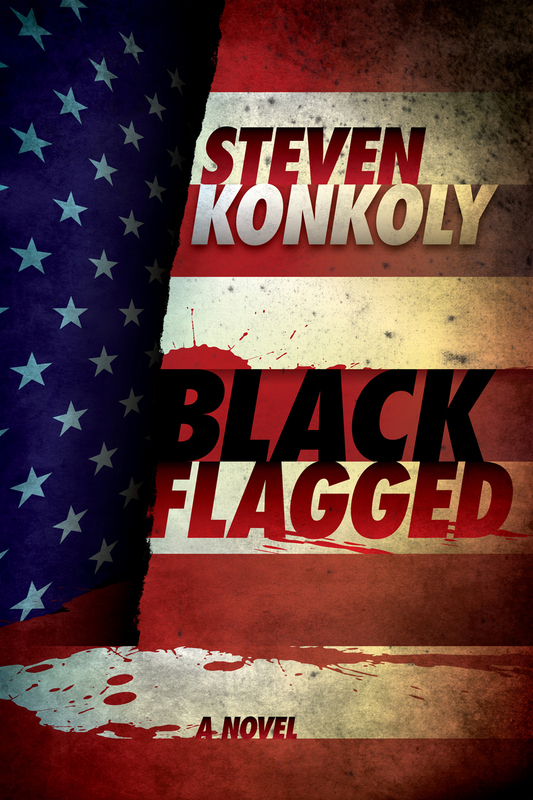 Congratulations on the release of Black Flagged, Steve. I just picked it up for my Nook. Really looking forward to reading it it. Great book. Kept me up reading. The pace was incredible, I felt like I had to stop reading occasionally and take a deep breath before getting back to running along with it. I don’t want to make any comments that would be spoilers. As a former Loyola history teacher, I loved the idea that someone from there would recruit anybody for that kind of work – proves you really have a fabulous imagination. On the other hand, I always had my suspicions about Northwestern. Glad to hear you’re working on the next book. I’m so glad you enjoyed Black Flagged! Yeah, I should include an oxygen mask with the book. At a certain point, there is very little rest for the reader…which I think is a good thing. Loyola and Northwestern? I’m from a small suburb of Chicago, right inside Indiana…so the area came to mind. Huge Serbian community. What history subject did you teach?…that’s pretty cool, and a funny coincidence. I was just hired by the course, as an ABD graduate student and taught the dreaded Western Civilization, Parts I and II. Also taught American History at what was National College in Evanston.